Question: Mr. Schnabel, would you be willing to tell us whether you prefer composing, playing or teaching? Artur Schnabel: …I prefer composing. …But all my composing was done as a kind of hobby. Officially, I am not a composer — I am labeled a pianist — so my composing was a kind of hobby, or love affair. I did it always during my vacation, in the summertime. …I am very happy composing, am not even interested in the value of my compositions, just interested in the activity. We learn, perhaps to our surprise, that Artur Schnabel (April 17, 1882 – August 15, 1951), the venerated Beethoven, Mozart and Schubert specialist, preferred composing to performing. Berg (b. 1885) and Webern (b. 1883) were contemporaries, and he died the same year as Schoenberg. His 1901 Berlin Philharmonic debut included his Romantic-styled piano concerto. Most listeners who treasure the pianist’s recordings are wholly unaware of his compositional bent. This Leschetizky student never brought his own pieces to the concert hall or recording studio. Indeed, the mature performing artist rarely touched contemporary music, despite premiering Korngold’s Second Piano Sonata (1910) in 1911 and assisting in an early Pierrot Lunaire performance alongside cellist Piatigorsky. Despite friendships with Schoenberg and Sessions, Schnabel was wary of serialism, preferring a chromatic language with frequent meter changes and detailed annotations. His music is not easy, yet it aligned with contemporaneous trends. Alongside Schoenberg, Berg or Webern, or Sessions, Babbitt and Carter, his would be among the more expressive, though not the most concerned with classical form and structure. Schnabel was particularly gifted at chamber music. “Helen Schnabel Plays Artur Schnabel.” Artur SCHNABEL: Concerto for Piano and Orchestra (1901); Seven Piano Pieces (1947); Reverie (1897); 10 songs from Opp. 11 and 14 (ca. 1901). Helen Schnabel (pno), Erika Francoulon (sop); Vienna Orchestra, F. Charles Adler (cond.). TownHall THCD-65 (http://www.townhallrecords.com/). The pianist-composer was a 19-year-old product of fin-de-siècle Vienna when he wrote and premiered his Piano Concerto with the Berlin Philharmonic in 1901. Later performances were given by Schnabel’s friend and student Eduard Erdmann and the composer’s daughter-in-law, Helen Schnabel. Originally a four-movement concerto, the composer permitted Erdmann to play the final Intermezzo and Rondo, but only if he were willing to attribute the work to “Leopold Beck” (Schnabel is German for “beak”) and include a grotesquely modernistic cadenza between the two late-Romantic movements! This TownHall CD reissue unites two SPA Records (the original recordings date from the 1950s). 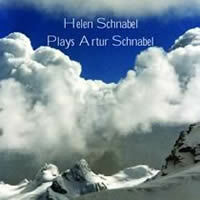 All tracks feature Helen Schnabel. Only the final two movements of the concerto are recorded, without cadenza. Except for ambiguous rhythmic patterns — a Schnabel trait — the concerto might pass for Brahms, Strauss or Reger. The memorable Rondo theme reappears in completely different surroundings in Schnabel’s Third Symphony. The song collection offers pleasant melodies and genial word painting. Reverie is a period salon piece with virtuosic aspirations. Schnabel composed Seven Piano Pieces in July 1947. Compared to the disc’s prevalent Romanticism, the modernist pieces startle, yet Helen Schnabel finds their poetry. Artur SCHNABEL: Dance Suite (1921); Piano Sonata (1923). Geoffrey Tozer (pno). Chandos CHAN 9673 (http://www.chandos.net/). Distributed in the US by Naxos (http://www.naxos.com/). The five-movement Dance Suite tells a romantic story with wit. Contemplative “rest” pieces separate a foxtrot and waltz. The second rest, Suspense, is a torpid lovers’ afternoon. The flashy waltz, a dynamic showpiece, as buoyant as anything by any Strauss (Josef or Richard), would make an excellent encore. Characteristically, Schnabel never played the suite, leaving the premiere to his disciple Erdmann. Contrasting the ostentatious Suite, Schnabel wrote the introspective Sonata for Erdmann in about a month’s time. The composer delighted repeating Toscanini’s dismissive question. That same year, Schoenberg’s 12-tone developments would result in his own Suite, Op. 25. Schnabel’s expressive atonality fits with the times, suggesting Berg instead of serialism’s progenitor, although Berg would have had to have been a concert pianist for his pages to approach Schnabel’s density. Consider the Sonata’s formidable movement titles: “Leidenschaftlich, stark und sehr bestimmt; ganz frei, gar nicht schnell, immer eher zurückhalten, doch immer noch gesangvoll,” “Durchaus zart und schlicht; ganz ruhig, sanft, lieblich dahinträumend, vollkommen frei,” “Frölich, schelmisch, keck, etwas eigensinnig,” “Ganz langsam. Versonnen, versenkt, erdfern,” and finally “Feurig, verwegen, ohne Aufenthalt, aber ohne Hast und Erregung, ganz gesund.” Characteristic of Schnabel’s revered Beethoven editions, the precisely notated music overflows with performance indications, tempo changes and pedalings. Schnabel’s improvisatory forms brim with motives undergoing continuous variation and development across the piano’s entire compass. There are no barlines to restrain the constantly varying beat patterns. Special effects include flurries of parallel seventh chords and pedaling held through trills and rapid passages. Schnabel’s thickly textured sonata is quite the antithesis of Schoenberg’s Op. 19, though the two slower movements contain elements of melody and accompaniment. Curiously, IV begins with a statement of all 12 chromatic pitches. These two works require fortitude, and Tozer does well. Both belong on Second Viennese School programs. 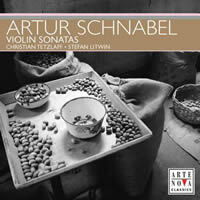 Artur SCHNABEL: Sonata for Violin and Piano (1935); Sonata for Violin Solo (1919). Christian Tetzlaff (vln), Stefan Litwin (pno). Arte Nova ANO 277980 (http://www.allegro-music.com/artenova). 1989 and 1992 recordings. 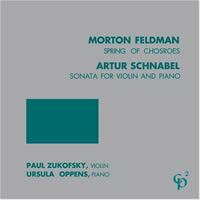 Morton FELDMAN: Spring of Chosroes (1977); Artur SCHNABEL: Sonata for Violin and Piano (1935). Paul Zukofsky (vln), Ursula Oppens (pno). Musical Observations CP2 102 (http://www.musicalobservations.com/). 1979 recordings. Artur SCHNABEL: Dance and Secret & Joy and Peace (1944); Sonata for Solo Violin (1919). 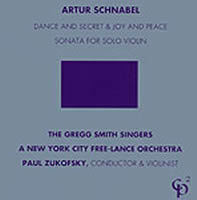 The Gregg Smith Singers, A New York City Free-Lance Orchestra, Paul Zukofsky (cond. ); Paul Zukofsky (vln). Musical Observations CP2 110 (http://www.musicalobservations.com/). Recorded in 1993 and 1983. Carl Flesch, one of Schnabel’s chamber music partners, premiered the five-movement solo-violin sonata in 1929. By all accounts, the gargantuan 45-minute work flopped. Flesch didn’t help matters when he printed and annotated the third movement in his Art of Violin Playing (1930), damning it with faint praise. The sonata’s atonality and perpetual variation — scored in precise detail though without bar lines — fuse into a bittersweet stream-of-consciousness. Momentary tonal motifs suggest forgotten folk tunes or hints of standard repertoire requiring an ironic stance, perhaps bewildering its dedicatee. The fourth movement, Äusserst rasch, best represents the Sonata’s improvisatory outlook. Alexander Schneider and Bruno Eisner premiered the sonata for violin and piano in 1944. The four 1935 movements flourish in a meaty, chromatic, relaxed Schoenberg style. The movement’s forms follow classical patterns, an opening sonata-allegro, a mercurial scherzo, a brooding adagio which builds to a sculpted climax, and a concluding rondo. Schnabel offers dizzying rhythmic challenges: The scherzo notates the violin in 1/2 whereas the piano takes the same bars in 5/8 except when the left hand progresses independently in 2/4 or 6/8. Tetzlaff and Litwin polish off the Sonata’s mesmerizing scherzo in 2:34. Technically adroit, their overall approach borders upon dutiful. Zukofsky and Oppens’ slightly more leisurely stance finds suitable kinship with Berg. Because a violin phrase in the Feldman mirrors the Schnabel’s opening, they pair the Sonata with Feldman’s Spring of Chosroes, dedicated to Zukofsky, who gave the work’s premiere with Oppens. Tetzlaff appreciates the solo Sonata’s seriousness, but slight impatience subdues the composition’s wryness. Arte Nova’s Schnabel bundling encourages efficiency, whereas Zukofsky’s undeniable affinity for these pieces puts his recordings on the shopping list. However, he pairs the solo sonata with perhaps Schnabel’s most obtuse composition, the cumbersomely titled Dance and Secret & Joy and Peace (1944), two movements for chorus and orchestra that use words from Robert Frost and the book of Isiah. Artur SCHNABEL: String Quartet No. 5 (1940); Piano Trio (1945); Seven Piano Pieces (1947). Pellegrini Quartet: Antonio Pellegrini, Thomas Hofer (vlns), Fabio Marano (vla), Helmut Menzler (vlc); Ravinia Trio: Saiko Sasaki (pno), Rainer Schmidt (vln), Helmut Menzler (vlc); Benedikt Koehlen (pno). cpo 999 881-2 (http://www.cpo.de/). Distributed in the US by Naxos (http://www.naxos.com/). Artur SCHNABEL: String Quartet No. 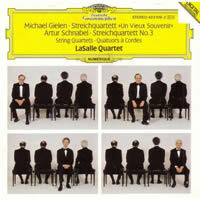 3 (1923-24); Michael GIELEN: String Quartet, “Un vieux souvenir” (1983). LaSalle Quartet: Walter Levin, Henry Meyer (vlns), Peter Kamnitzer (vla), Lee Fiser (vlc). DG 423 109-2 (O/P). 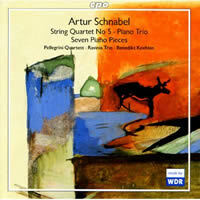 A 2004 cpo disc unites a scattering of fine Westdeutscher Rundfunk Köln recordings from 1992 (Seven Pieces), 1997 (Piano Trio) and 2002 (String Quartet No. 5). The centerpiece, the three-movement Piano Trio, is the keeper, an assured and animated 22 minutes of atonality. Schnabel confidently maintains a transparent texture among mercurial rhythms. The conversation may be hard to follow, but the scenery is marvelous. Schnabel’s final quartet, his Fifth, nears a half-hour. Denser than the Piano Trio and not just because of the ensemble’s homogeneity, the quartet bucks through a ravenous atonality. I’m thinking it’s not coincidence that the same cellist appears in both quartet and trio. The Pellegrini appear to be exploring similar byways: They’ve recorded K.A. Hartmann and Busoni for cpo. Alternating slow and fast, the Seven Piano Pieces, tight miniatures, were written one-a-day during July 1947. Koehlen brings a Romantic mellowness — not just because of the Les Adieux hints — and these pieces do indeed look backwards. I would have liked to hear more of Sasaki’s crisp pianism. A 35:48 through-composed block, Schnabel’s highly expressionistic Third String Quartet rivals contemporaries Schoenberg, Hindemith and Hába for its extroverted demeanor. The LaSalles deliver emphatic emotion, though with score in hand, they’re having their way with Schnabel’s precise and continually changing tempos. The quartet’s germ is easy to spot as it transforms across the traditional four-movement structure: fast, slow, scherzo, finale. Incorporating two Baudelaire settings, “Carrion” and “The Swan,” Gielen’s 1983 avant-garde playbook requires talking and foot stomping. This out-of-print item is worth seeking for the Schnabel. 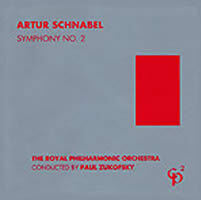 Artur SCHNABEL: Symphony No. 1 (1938); Symphony No. 3 (1948-49). 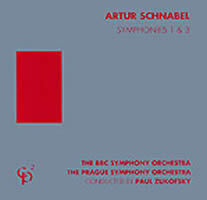 BBC Symphony Orchestra, Prague Symphony Orchestra, Paul Zukofsky (cond.). Musical Observations CP2 109 (http://www.musicalobservations.com/). 1994 and 1992 recordings. Artur SCHNABEL: Symphony No. 2 (1941-43). Royal Philharmonic Orchestra, Paul Zukofsky (cond.). Musical Observations CP2 104 (http://www.musicalobservations.com/). 1988 recording. The only symphony performed during the composer’s lifetime, Schnabel’s First reflects his Austro-Germanic roots. The long, atonal lines suggest a morose Korngold or Krenek. (Schnabel fled Berlin in 1933, and after spending time in England and Italy, arrived in America in 1939.) Preferring gravity over glitz, Schnabel’s orchestration maintains classical models: negligible coloristic effects, meager percussion, and violins carrying most of the argument’s weight. Few exact repetitions deter initial comprehension. The outer movements thrash in anguish; the Largo con devozione e solennitá pouts at late Mahler. 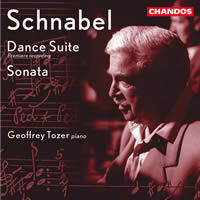 The scherzo shows a lighter touch, best displaying Schnabel’s orchestral potential. Schnabel’s colossal Second requires an hour. The expressive atonality suggests Schoenberg and Sessions. (The latter was a close friend. Schoenberg was forever annoyed that the pianist never toured with his music.) Schnabel’s continually fluctuating phrase lengths indicate a fluidity absent from his contemporaries’ music. While his cerebral concerns may work on paper, in the air the deterministic pulse grows torpid. The third movement, a massive Largo (18:52), grinds to a standstill, casting off pale sparks until its engine re-engages for the closing movement. Compared with other contemporary symphonies, Schnabel’s first two contain little theater or drama. Stravinsky’s 1945 Symphony in Three Movements may be the decade’s most enduring symphonic product, the sharp creases of which contrast with Schnabel’s bloat. Those who crafted the mid-century’s “difficult” music tended towards more succinct hooks-and-release. I’m thinking of Sessions’ mahogany-hued Second (1946) with its catchy final movement’s ritornello (CRI CD 573), Wellesz’ quasi-Brucknerian atonal Third (1949-51, cpo 999 999-2), Gerhard’s First (1952-53) with its explicit Schoenbergian trajectory (Montaigne MO 782103), and Searle’s 1952-53 feisty First (singly: cpo 999 541-2; set: cpo 777 131-2). Schnabel’s faster movements, such as the First’s scherzo, fit comfortably with these. The approachable Third marks a point of arrival (he had heard his First in 1946). At just under 30 minutes, Schnabel’s statements are compact and forceful, with complex meter changes and calisthenic logic. The descriptive movement titles (Fantasia, Dance, Introduzione and Thema) provide clues. The final movement varies the 1901 Piano Concerto’s Rondo theme the startling tonality of which, delivered by piano, is soon ambushed by the orchestra in an Ivesian manner. This Third puts Schnabel the symphonist on the map. Champion Zukofsky must be commended for his dedication and perseverance in both Schnabel’s chamber and symphonic repertoire. These symphonic recordings may not be the friskiest, but they do convince. Without Zukofsky’s diligence, the Schnabel discography would be close to negligible. It’s evident that Schnabel’s own performing experience contributed to his chamber music successes. Most likely his Third would have been the first of many orchestral triumphs. I would look, hopefully, to Naxos or cpo for fresh sets of the complete symphonies or string quartets. Out-of-print recordings of other works include a Columbia LP of the String Trio and Duodecimet, Schnabel’s first foray into serialism left incomplete at his death.